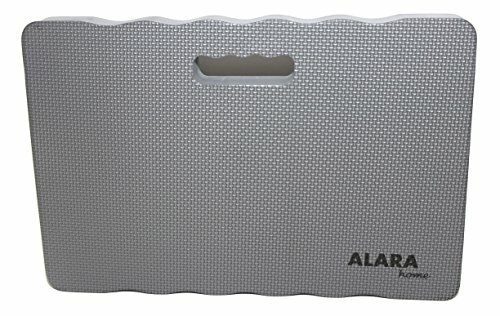 The Alara home heavy duty kneeling pad is the is the highest quality knee pad in the market. Cheaper kneeling pads are available but are not as durable. We use the highest quality material in our foam kneeling pad. Our super protective pad is 1-½ inches thick and will protect your knees much better than the standard kneelers on the market today. Designed to withstand impacts from stones and rough ground when used outdoors. We have increased thickness which also equals increased stability and support your body needs. This kneeler is resistant to water and dirt which makes it super easy to clean-simply hose it off or wash in the sink. Minimal water absorption pad keeps you dry, is easy to clean and dries quickly, which makes it the ultimate baby bath tub kneeler. Beach Kneeler, Portable Seating Pad and so much more! DIMENSIONS: Extra Large (XL) & Extra Thick - 18 x 11 x 1-½ INCH MATERIAL: High Density, Non-Recycled, Durable Material ensures your knee cushion lasts for many years. MULTI-FUNCTION KNEELER - Perfect for household chores, baby bath, automotive, plumbing, mechanics, tile and flooring, gardening and many other uses! SUPER DURABLE HIGH DENSITY FOAM - This kneeler is made from high quality/high density foam so it won't break apart like other kneelers. Special design resists water and dirt so it is super easy to clean. LIGHTWEIGHT & PORTABLE - Light enough to take along but heavy enough so that it stays put! Built-in handle so it is very easy to carry. COMFORTABLE FOR YOUR KNEES - Helps reduce pain. The material is sturdy and rigid so it won't buckle while providing the support you need while you keep steady and on task. 100% SATISFACTION GUARANTEE WITH 1 YEAR WARRANTY - We are so confident that you will love this product, that we offer a full guarantee. We will replace your knee pad or offer a full refund If for any reason you aren't completely satisfied with your order. That's the Alara Promise. If you have any questions about this product by ALARA HOME, contact us by completing and submitting the form below. If you are looking for a specif part number, please include it with your message.